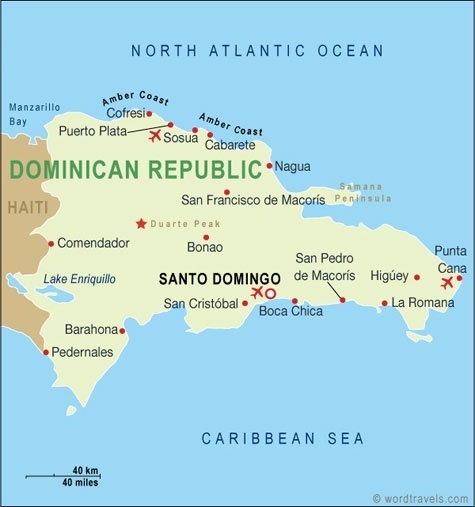 The Dominican Republic lies about 800 miles/1,280 kilometers southeast of Miami and is bordered in the Greater Antilles chain by Cuba to the West, and Puerto Rico to the East. The island of Hispaniola, which the Dominican Republic shares with Haiti, totals some 18,704 square miles/ 48,442 square kilometers (comparable to the size of Slovakia or bit bigger than Maryland), making it the second-largest island in the Caribbean. Punta Cana lies on the East Coast of the country. The area of Punta Cana encompasses several microregions. From South to North they are: Cap Cana, Punta Cana, Cabeza de Toro, Bavaro, El Cortecito, Arena Gorda, Macao and Uvero Alto.